Egypt has been famous for its productive and prominent agriculture for many centuries. For the past two decades, its agricultural sector has faced innumerable constraints and issues, lowering its yields and limiting economic returns. Agricultural Extension and Advisory Service has played an appreciable role in elevating crop yields, that in turn contributed towards national economy and improved rural livelihoods. However, due to multiple distortions, National Extension System needs to be revisited. The chapter examines the present fuctioning of extension system, identifies the constraints faced by the agriculture sector and the shortcomings of the agricultural extension department. Based on these analyses, improvement measures have been suggested and viable and workable development strategies outlined for improving the working of extension. The objective of the chapter is to optimise farmer practices in sustainable agriculture to achieve food security. The information provided could be helpful to the farmers, the planners and the policy makers to develop the agricultural sector on sound footings by employing scientific principles and practices of sustainable agriculture to achieve food security in the country. An improved extension system can help realize sustainable agriculture and achieve food security if strong links are established among Egyptian Agricultural Departments (Agricultural Reseach and Development) and National Agricultural Extension Service (NAES). Further it is important to have a strong coordination to ehance the working efficiency of the both departments to meet national needs. CAPMAS. (2016). http://www.capmas.gov.eg/ (the website of the Central Agency for Public Mobilization and Statistics). Goldfond, J. (2015). Food insecurity and climate change in Egypt. 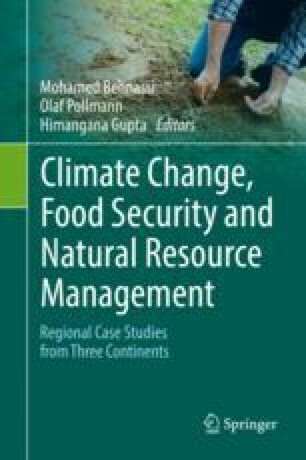 Available at: http://www.worldpress.org/article.cfm/Food-Insecurity-and-Climate-Change-in-Egypt. May 4, 2015.